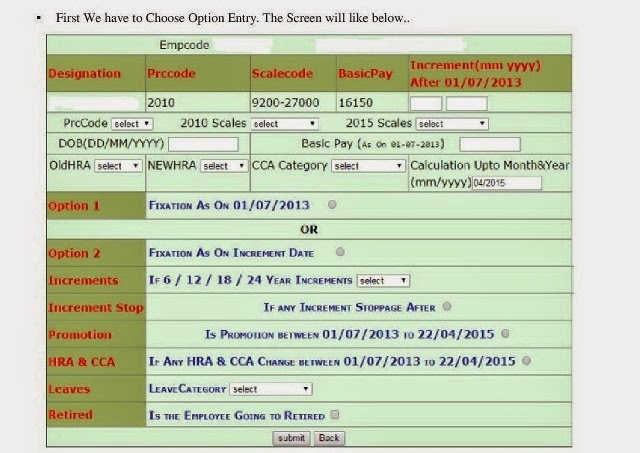 Click on the 1st sub menu namely " PRC Details and Report"
The Screen will ask you to Enter the Employee Treasury Number. We can see Seven tabs in this screen namely Option Entry, PP SP, Option Form, Appendix-I, Appendix-II, Fixation Arrears, Bill Preparation.  First Two Tabs namely Option Entry, PP SP are the Online Bill Preparation Forms. Option Form, Appendix-i, appendix-ii, Fixation Arrears are the forms that can be downloaded after Filling of Option Entry, PP SP Tabs. In the Above Screen the incumbent’s has to be selected or filled wher ever necessary. After entering all the required fields Click on Submit. In the Next Tab Enter the FP and SP Details of the incumbent. After that the Option Form with Details, Appendix-I, Appendix-II, Fixation Arrears can be downloaded from clicking the Tabs. Verify Once all the Details. Then go to Bill Preparation Tab and Prepare Bill. 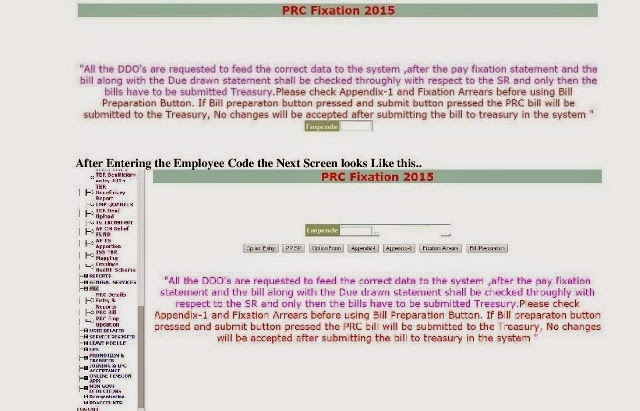 This is un-official and useful review and information on How to Prepare PRC 2015 Bills Online at DDO Req and we can wait if there are any official detailed process to be released by Treasury Authorities.